Manchester United manager Jose Mourinho has been asked by the Football Association to provide his observations on comments he made ahead of last weekend’s derby against Manchester City. Mourinho has until 6pm on December 18 to respond to the request, relating to comments made on December 8, two days before the match which City won 2-1 at Old Trafford. An FA statement did not specify which particular remarks were of interest, although Mourinho said in a press conference that it only takes a “little bit of wind” to knock City’s players over. The FA has requested observations from Jose Mourinho for pre-match media comments he made on Friday 8 December, prior to last Sunday’s match against Manchester City. He has until 6pm on Monday 18 December to respond. In his pre-match press conference, Mourinho said: “They are a good team. They defend well, they react well to the moment they lose the ball. They have a good dynamic in attack, they have creative movement. They have amazing players, they have a fantastic coach, they have lots of good things. Mourinho also suggested he would not be allowed to wear a ribbon like the one that City boss Pep Guardiola has worn in support of imprisoned Catalan politicians. Both City and United have already been asked to provide observations on a post-match fracas in the tunnel at Old Trafford. 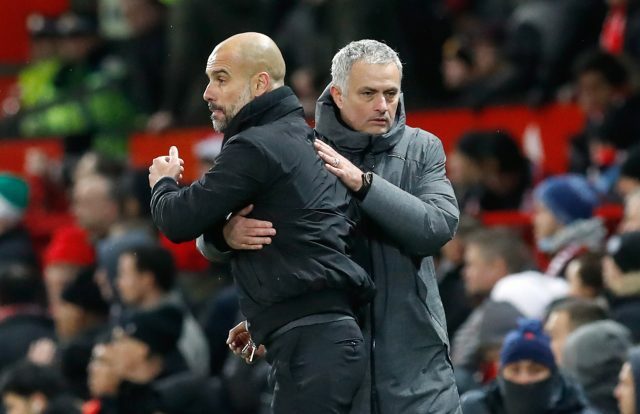 It has been reported that Mourinho went to the City dressing room to complain about excessive post-match celebrations, sparking a melee in which he had milk and water thrown at him while City coach Mikel Arteta suffered a cut to the head. The clubs have until 6pm on Friday to respond to that request. After the match, which put City 11 points clear of United at the top of the table, Mourinho had complained that United should have been awarded a late penalty when Ander Herrera tumbled under a challenge from Nicolas Otamendi. Herrera was instead booked for simulation.